ATLANTA, GA – The Atlanta Music Project (AMP) Summer Series, a music festival and school, has announced its second annual concert series with an opening night performance featuring the Grammy Award-winning Harlem Quartet. Praised for its “panache” by The New York Times, the Harlem Quartet made its public debut in 2006 at Carnegie Hall. Since then the New York-based ensemble has performed throughout the U.S. as well as France, the U.K., Belgium, Panama, Canada, and in South Africa. 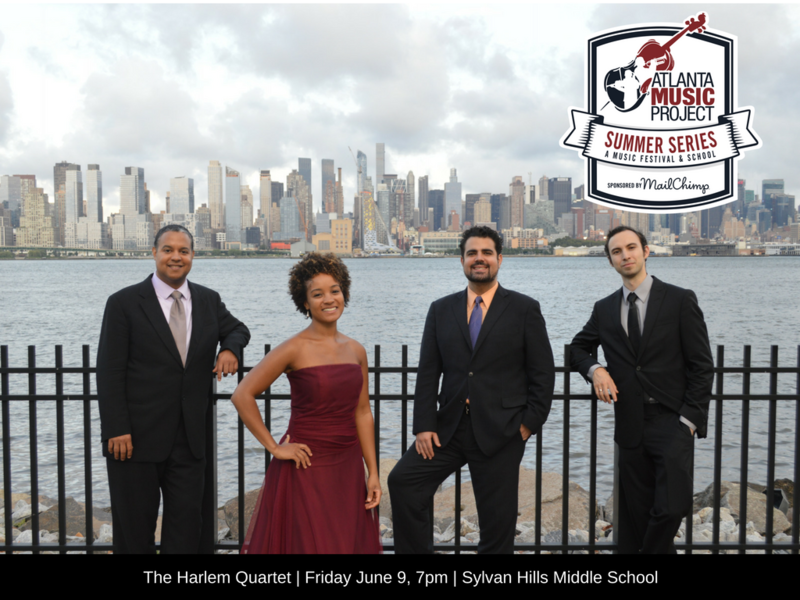 The Harlem Quartet will perform on Friday, June 9, at 7 p.m. at Sylvan Hills Middle School in the Sylvan Hills neighborhood of Southwest Atlanta. The program will include jazz and Latin standards by Duke Ellington, Antonio Carlos Jobim, and Billy Strayhorn, Wolfgang Amadeus Mozart’s String Quartet in B-flat Major, K. 458 “The Hunt” and Felix Mendelssohn’s Octet in E-flat major, Op. 20. The concert is free and open to the public. The AMP Summer Series concert series continues on Wednesday, June 14, when the faculty of the AMP Summer Series will share the stage with students in a side-by-side concert. Monday, June 19, brings an evening of chamber music, featuring instrumental and vocal ensembles. Conductor Verena Lucia-Anders leads the AMP Summer Series Festival Choir in its final concert on Wednesday, June 21, and conductor Jason Ikeem Rodgers leads the AMP Summer Series Festival Orchestra on Thursday, June 22. All concerts are free and begin at 7:00PM at Sylvan Hills Middle School. Launched in 2016, the AMP Summer Series is a tuition-free, three-week summer music festival and school, the foundation of which is three weeks of intensive orchestral and choral music instruction for 115 experienced middle school and high school-aged students. Students receive group lessons with AMP teaching artists, participate in master classes and workshops and perform in orchestra and choir. MailChimp is a major sponsor of the 2017 AMP Summer Series. The AMP Summer Series is inspired by the great American summer music festivals, such as the Aspen Music Festival, the Interlochen Music Camp, and the Brevard Music Festival. The AMP Summer Series is a program of the Atlanta Music Project, a year-round tuition-free after-school music program for youth based in underserved neighborhoods of Atlanta. The Harlem Quartet, praised for its “panache” by The New York Times, is “bringing a new attitude to classical music, one that is fresh, bracing and intelligent,” says the Cincinnati Enquirer. The quartet’s mission is to advance diversity in classical music, engaging young and new audiences through the discovery and presentation of varied repertoire that includes works by minority composers. Since its public debut in 2006 at Carnegie Hall, the New York-based ensemble has performed throughout the U.S. as well as in France, the U.K., Belgium, Panama, Canada, and in South Africa, where under the auspices of the U.S. State Department they spent two weeks on tour performing concerts and participating in outreach activities. The Quartet completed the Professional String Quartet Residency Program at New England Conservatory in 2013, and participated in NEC’s string quartet exchange program in Paris, working extensively with violinist Günter Pichler. In addition to performing on chamber music series around the world, Harlem Quartet has collaborated with such distinguished performers as Itzhak Perlman, Ida Kavafian, Carter Brey, Paul Katz, Fred Sherry, Anthony McGill, Paquito D’Rivera, and Misha Dichter (with whom the quartet made their Kennedy Center debut in February 2013). Harlem Quartet has also worked closely with jazz legends Chick Corea and Gary Burton, with whom the quartet recorded the album titled “Hot House.” Following a concert tour of twenty-five major cities, the Harlem Quartet’s recording with Corea and Burton entitled “Mozart Goes Dancing” won a Grammy Award for Best Instrumental Composition in February 2013. The winning ensemble will continue their “Hot House Tour” in Japan in June 2014. The Harlem Quartet has been featured on WNBC, CNN, the Today Show, WQXR-FM, and the News Hour with Jim Lehrer. In 2009 they performed for President Obama and First Lady Michelle Obama at the White House and appeared Christmas morning on NBC’s Today Show. They made their European debut in October 2009 performing at the residence of the U.S. ambassador to the U.K., and returned to Europe as guest artists and faculty members of the Musica Mundi International Festival in Belgium. Harlem Quartet is regularly featured at jazz festivals around the world, including the Panama Jazz Festival in Panama City, Montreal Jazz Festival, and Miami Nice Jazz Festival. www.harlemquartet.com. Founded in 2010, the Atlanta Music Project provides intensive, tuition-free music education for underserved youth right in their neighborhood. Now in its seventh year of programming and serving 250 students at five sites, AMP provides all its students with an instrument, a teaching artist, classes and numerous public performance opportunities. AMP does not hold entrance auditions – the only requirement is a commitment to attending all classes. AMP’s programs include: the AMP Orchestra; AMPlify, the choral program of the Atlanta Music Project; the AMP Academy, which provides advanced musical training to AMP’s most talented and dedicated students; and the AMP Summer Series, a music festival and school. AMP’s young artists have performed at Atlanta’s most prestigious venues, including the Woodruff Arts Center, Spivey Hall, and the Rialto Center for the Arts. In 2015 Clayton State University established the Atlanta Music Project Endowed Scholarships, providing college scholarship funds for AMP students. In 2016 the White House named AMP one of the top 50 after-school arts programs in the nation. AMP is the recipient of the prestigious 2016 Bank of America Neighborhood Builders award. www.atlantamusicproject.org.